Top attraction in Dublin: Kilmainham Gaol. Just outside the city center you will find this unoccupied prison. The prison opened its doors in 1796 and many political prisoners were detained here. In 1924 the prison was shut down and changed into a museum. Now it is still the symbol of the battle of the Irish independence. To visit the prison you’ll have to take a tour, but it is worth it! Hearing about the Irish history was very interesting and the tour guides are super enthusiastic. Best thing to do is book you tickets up front as waiting lines can be very long! 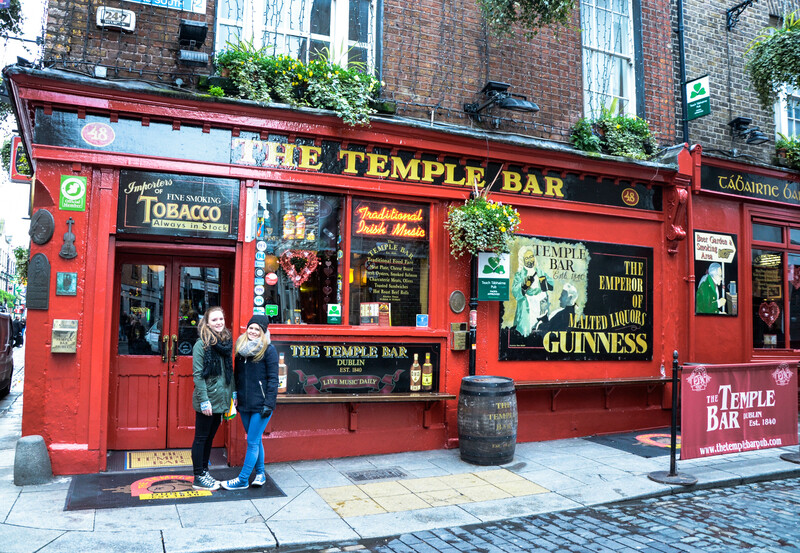 Temple bar is located in the center of Dublin and it is the place to be when you want to have a drink and have some fun! It is a quarter with small streets and narrow alleys full of boutiques, bars and restaurants. I would recommend to come here twice. One time during the day to look at all the fun shops and the nice architecture and one time at night. Enjoy the folklore, the typical music and do a little dance! In de middle of the city you’ll find the St. Stephen’s Green Park. A calm and green oasis in between the crowds. There are a lot of historical moments to the Irish history. I really loved the beauty and the relaxing vibe in this park. St. Patrick’s Cathedral is the biggest church in Dublin and is devoted to the patron saint of Ireland (Saint Patrick). This is because he converted many Irish to Christianity during the 5th century at this place. Later, in 1191 they started building the Cathedral. Well, not really, because I don’t like it (LOL), but a citytrip in Dublin isn’t complete if you haven’t been to the Guinness Storehouse. The museum is located in the St. James’s Gate Brewery, which was the production site of the beer since 1759. It is a really interactive museum where you’ll learn everything about the brand, how this beer is made and of course you can taste the beer. You’ll get your beers at the Gravity Bar (Head of the Pint) where you have those amazing panoramic view. Located in the Phoenix Park, you’ll find Dublin Zoo. In Belgium there is a TV program about it, and now we are in Dublin, we wanted to see this zoo for ourselves. It is one of the oldest and most popular zoo’s in the world. If you are looking to do something different that stroll around the city and looking at all those beautiful buildings, I suggest you go to Dublin Zoo for a nice afternoon looking at the animals. The oldest university of Ireland, Trinity College, is open for visitors. The architecture of the building is remarkable and there is a lot of cool art around. In 1793 they got their first students. The biggest tourist attraction here is the “Book of Kells”, which is housed in the Old Library building. My sister and I have done years of tapdancing ourselves and now we were in the country of tap-dance, so we had to check it out. On my sisters birthday we booked a table at tapdancing show and we had so much fun! You’ll get typical Irish food and drinks and you’ll have the best time of your life. If you want to get out of the busy city, a day trip to the small fishing village Howth is a good idea. It is only a 25 minute train ride from the city center of Dublin. There are many things to do here, but we just enjoyed a nice walk along the pier and the coastline. Strolling through the small street, you’ll pass nice boutiques, little restaurants and good bars. So this was it… I’m so sad that Gilles has not experienced this trip with me. Now I’ve seen a glimpse of the beauty of Dublin, I definitely want to go back there in the future (during the summer), because there is so much more to see. Hope you enjoyed reading about my fantastic trip in Dublin. If you have any questions, please let us know, maybe we can help you!